The Garden City terminal of the Port of Savannah is located on the Savannah River north of the city of Savannah and east of the city of Port Wentworth. The terminal is owned and operated by the Georgia Ports Authority (GPA) and is currently the fourth-largest container port in the United States. 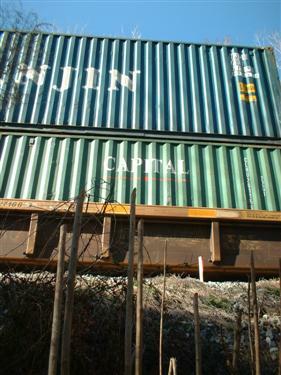 The terminal is convenient to Interstate I-95 and CSX and Norfolk Southern main railway lines and is one of the most efficient ports to supply the inland east coast with container freight. 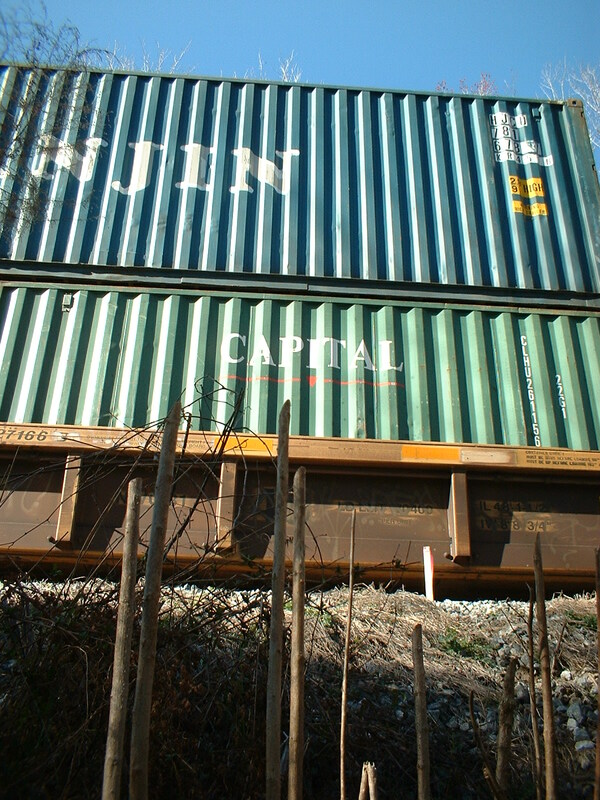 The GPA website boasts “…two to three day transit times to major hubs throughout the Midwest, Gulf Coast and Southeast, including overnight service to Atlanta, the fastest of any North American port.” The terminal’s intermodal container transfer facility (ICTF) and easy-access to arterial transportation lines puts the port in efficient reach of nearly 70% of the United States. The terminal’s speed and efficiency of transferring and dispersing containers has readily increased port demand and traffic and thus increased the need for port expansion and improvement. An estimated $1.2 billion is planned for the massive expansion of the Garden City terminal. Expansion efforts include deepening the Savannah River throughway from the current 42 feet to 48 feet and adding multiple high-speed super container cranes. These efforts and others planned by the GPA should increase throughput capacity from the current 2.62 million TEUs to 6 million TEUs in 2018. As the Garden City terminal of the Port of Savannah expands, so must the transportation lines that feed it. In October 2007, GeoSystems was contracted by Norfolk Southern to provide geotechnical investigation services for a wye track connection planned in Port Wentworth, Georgia. The track was planned to connect Norfolk Southern’s north-south main line with the Port Wentworth lead track, an east-west connection to the Garden City terminal. 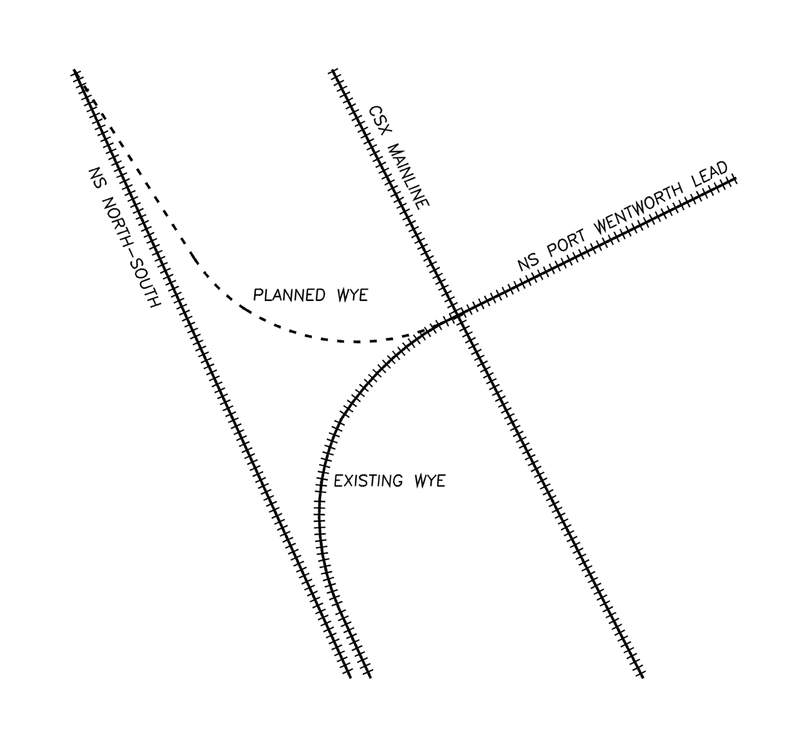 A ‘wye’ connection is a triangular shaped rail junction where an inbound train can turn from one track to a perpendicular track. Currently, trains travelling west out of the Garden City terminal can only turn south onto the Norfolk Southern north-south line. North bound trains must first turn southward than stop and reverse engines to travel in a northward direction. Multiple at-grade roadway crossings further complicate travelling through the junction. The railways plan to complete the northern approach of the Port Wentworth wye track will allow for direct northward turns from the terminal, avoiding train reversal and two at-grade crossings. The new wye connection will use approximately 3,100 feet of track installed over very slightly sloping grades. A large embankment is required to achieve planned grades. The purpose of GeoSystems’ investigation was to determine subsurface conditions in the area of the new track embankment and locate/identify concerns and possible hazards to railroad construction. The first site visit conducted by GeoSystems confirmed that nearly 1,800 feet of the total 3,100 feet of planned track was currently located over wetlands. The remaining approximate 1,300 feet was planned over a sloping upland area. Relief across the site was estimated at 47 feet, with the wetlands at a low elevation of roughly 9 feet and the upland connection to the Port Wentworth lead track at roughly 56 feet. The wetland areas consisted of standing water, fallen organic debris, and large trees. Our preliminary investigation consisted of soil test borings within the upland areas and along the existing north-south track adjacent to the wetlands and portable soil hammer tests conducted by field engineers. The soil hammer tests approximated relative density of shallow soils. After compiling our field data, it was agreed that additional testing within the wetland area was needed. Our supplementary investigation consisted of cone penetration testing (CPT) performed by a WPC rig and operators working from timber soil mats supported on felled wetland vegetation. 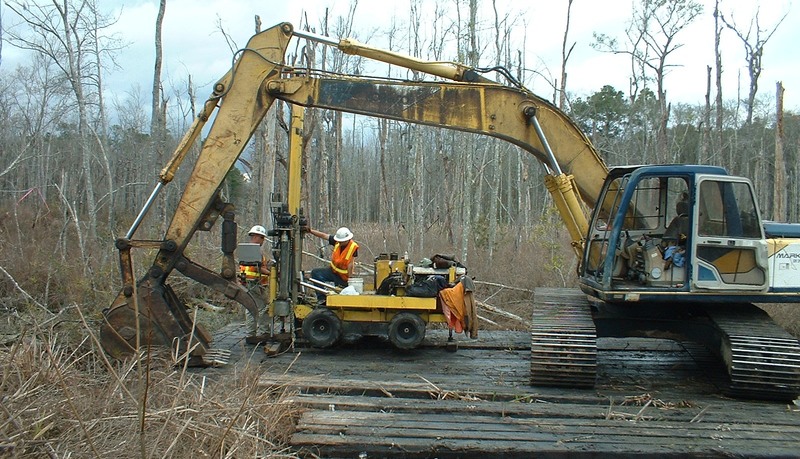 GeoSystems developed plans to move the timber mat platform into the wetlands with a contract excavator and chains. The mats were hoisted by the excavator and lifted over the CPT rig to advance the working crew. Operating the compact CPT rig and excavator on the same mats was difficult but necessary as the soft surface was not sufficient to support any machinery without extensive modification. Data recorded from the cone penetration tests showed very soft to soft soils to depths of twenty feet in the central portion of the wetlands. After the supplementary CPT investigation, GeoSystems was well suited to begin its analysis and report preparation. Our report included subsurface characterization of the entire length of planned track, suitability of borrow materials for embankment construction, recommendations on embankment, expected embankment settlements, slope stability, and other topics. Subsurface soil strengths were estimated from soil test borings and CPT results as well as soils information from previous projects in similar soils. Settlement and slope stability calculations were performed for various heights of the embankment fill over the wetland area. Settlements were found to exceed 20 inches under the large loading conditions and with little support from soft foundation soils. The soft foundations also contributed to marginal safety factors for embankment slopes across the wetlands. In areas where the embankment was relatively short bearing capacity was also a concern. GeoSystems began plans to increase the rate of settlement of foundation soils and bolster the strength of the constructed embankment. Wick drains spaced at 5 feet or greater were planned in the wetland areas to increase the rate of consolidation and decrease pore water pressures under the load of the constructed embankment. In collaboration with Tensar Corporation, GeoSystems developed a plan to include a single layer of bi-axial and multi-layers of high-strength uni-axial geotextile material to increase embankment strength and safety factors for slope stability and bearing failure under the embankment. Calculations for slope-stability were performed by GeoSystems and Tensar Corporation. Rate of consolidation and settlement, wick drain spacing, and seismic stability were performed by GeoSystems Engineering. After construction is initiated, GeoSystems will provide un-interrupted field evaluation and testing of the embankment. In collaboration with Geocomp Corporation, GeoSystems will provide real-time site monitoring of the embankment construction. Construction is slated to begin in fall 2009.